Every once in a while, I actually create jewelry for myself, and here is my newest piece, the Intention Ring. I originally heard of this concept on Oprah where she spoke about something called wish boards (or dream, spirit or intention boards). I then took a workshop with one of my mentors Gretchen Reid of Motherhood Transitions and we actually made our own boards. We cut out pictures and words that resonated with us and our goals. 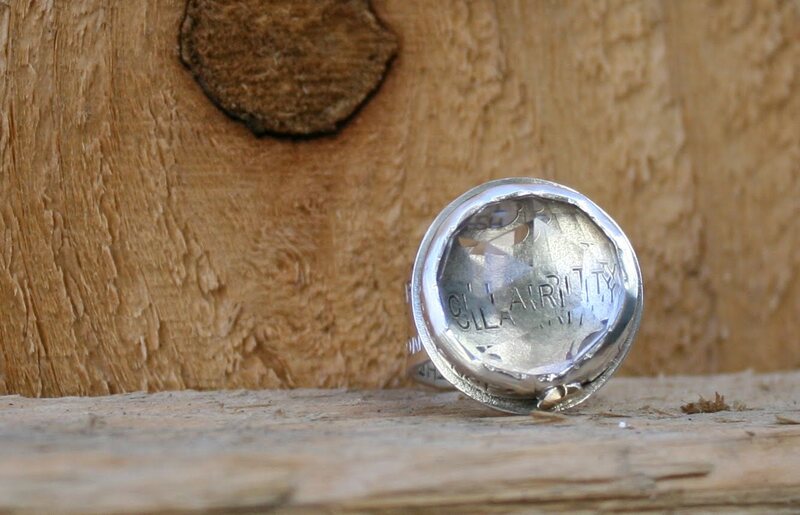 I thought I could easily translate that same idea into a ring with the theme being centered around the year 2010 and the qualities I wished to manifest for myself in this new year and new decade. I used quartz crystal because this particular gem just grabbed me at the gem show and also because of the intense energetic qualities quartz crystal brings to it's wearer. It is the stone of "clarity" and that is the word I inscribed in the center, looking through the facets of the stone causes the word to diffract in a most lovely and poignant way. 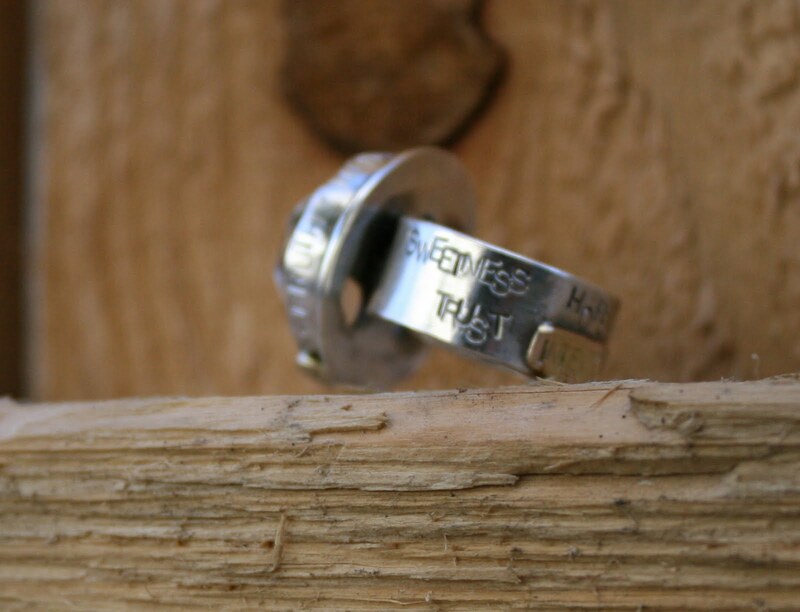 I used a sparkling faceted chunk of quartz, set in sterling with words such as "trust" and "mystery" inscribed on the band and bezel, and added 14k gold accents, partly for color and partly because gold metal in and of itself has so much value and longevity. All in all, I am thrilled with how it came out and I really haven't taken it off since. 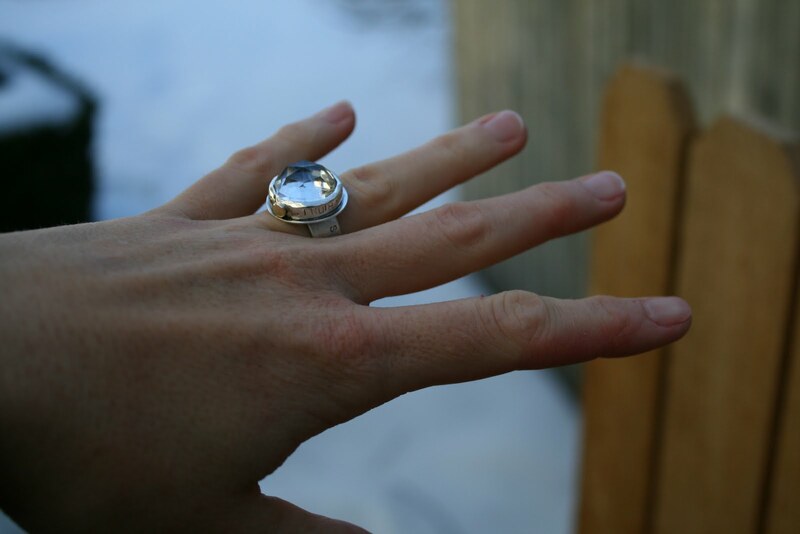 Please contact me if you have a vision for your very own 2010 intention ring, I would love to do custom orders on this one. I used to collect jewelry. My rule was that I couldn't buy a piece that I could make myself. Now a days I just collect and wear my own jewelry, partly because I just adore it (am I allowed to say that?) but also because I'm my own best advertisement and I like having a personal archive of favorite pieces that I have made in the past. It's fun to examine old pieces and see how my design and craftsmanship have evolved over the years. This is about 1/3 of my ring collection. 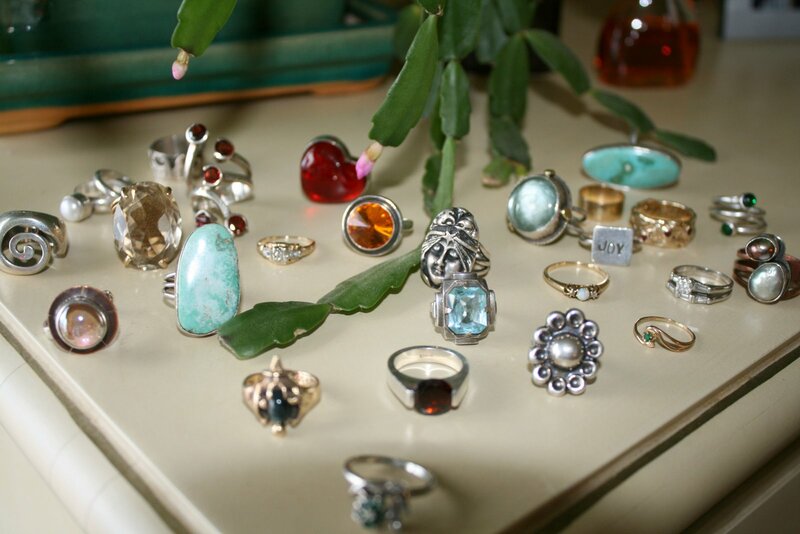 I have included most of my favorites here, rings that I have made and rings that were given to me by my most precious people. I made 8 of these rings (can you spot them?) and there are 5 wedding rings among them (not all mine!!). By the way, I just started selling my infamous Jewel Rings online in my Smashing Darling Store...Check them out- they're fabulous!